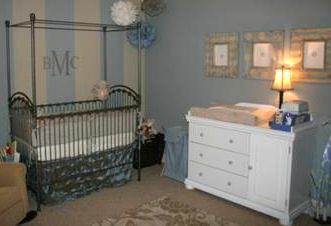 Restful, calming gray nursery room for our baby boy decorated in serene shades of blue, silver and ivory. Here are pictures of my baby boy's calming blue, silver and ivory nursery now that it's completely decorated. I really wanted to design the room so that it would be a calming place where me and my little man could relax and just spend time together in peace. 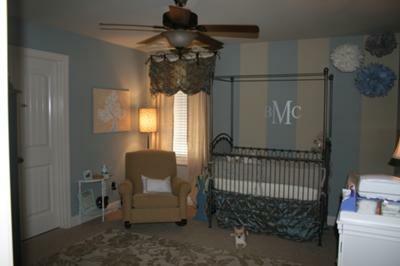 I chose a warm nursery color combination that includes restful shades of gray, dreamy blue, silver and ivory. I made the tissue paper pom pom ceiling mobile myself to match the baby's blue nursery color combination. I chose the color of the nursery wall letters to reflect the crib's dark finish. There are many items featured in the pictures of my baby boy's calming blue silver and ivory nursery room that I made myself. The curtain panels as well as the tie top window valance are handmade by me. The pleated tucks of the topper were a challenge and had to be sewed by hand but the results made them worth every stitch. The accent wall behind the baby's crib is painted in alternating stripes of ivory and blue. The wall painting technique contrasts nicely with the harlequin pattern featured in the artwork on the opposite wall of the room. My baby boy's nursery turned out exactly like I had planned. I enjoy the peaceful atmosphere of the room and I hope my little fellow does, too. Please visit Unique Baby Gear Ideas often to see more beautifully decorated nurseries for boys.